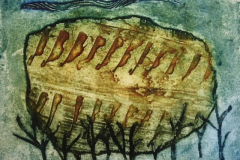 Carole is a printmaker who enjoys experimenting with texture and colour. Living in the Tyne Valley, and previously on the North Yorkshire Moors, she is influenced by the natural beauty of her environment. For this exhibition the artist is revisiting places that have been important in her life or a place visited and not forgotten. She has used collagraphs as the main focus of this work. 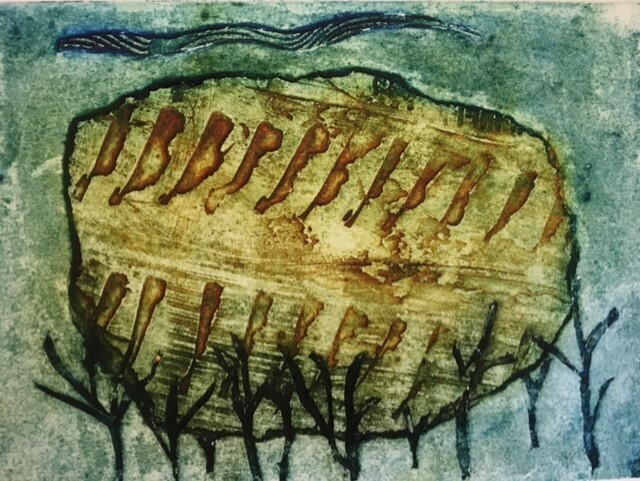 Creating collagraphs has given Carole the opportunity to develop the idea of texture within the work. She has centred some of the pieces on the concept of old walls and the stories within the stones and bricks. In addition to developing the use of Collagraphs the artist has recently been drawn to wood block engraving after volunteering in the print room at Cherryburn, the birthplace of Thomas Bewick. Carole has incorporated some wood block engravings into the work of this exhibition. She has found the contrast between the controlled discipline of engraving and the freer unexpected results from collagraphs interesting and exciting. The Artist has chosen birds associated with places that have an emotional connection to her for the engravings. Carole is constantly looking for ways to externalise the emotions and impressions she experiences in the world around her, be it physical or otherwise. She hopes that this exhibition shows, in some small way, her interpretation of that world.